I am beyond excited to show off my newest design in Knit Simple magazine! The Winter 2013 issue hits newsstands on December 10th. And inside you'll find this big, warm color-changing scarf. 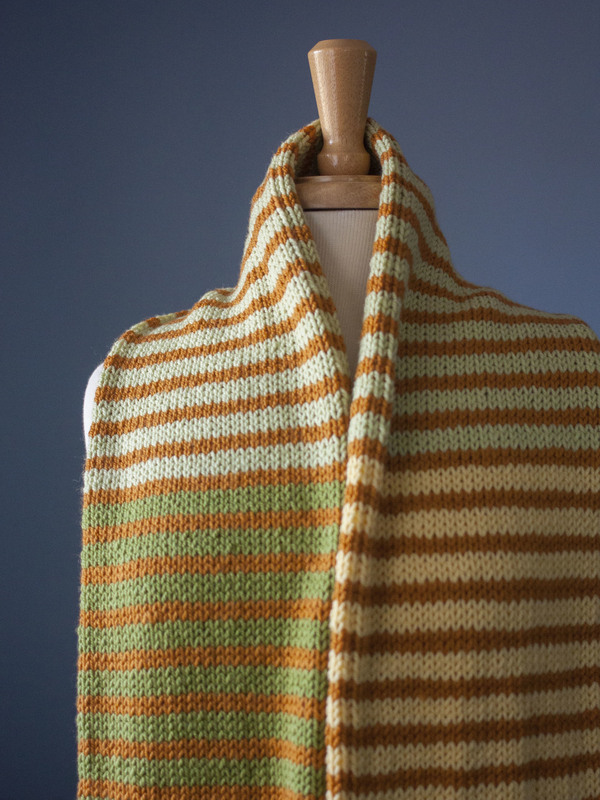 The Striped Transition Scarf has three color block sections that transition from yellow to light green to green all while alternating with stripes of a warm orange. In Wooly Worsted yarn that translates to Lemon Chiffon, Soft Sage and Pistachio color blocks with stripes of Saffron. The Striped Transition Scarf is also knit in the round so it works up quickly and you can carry all those color transitions up on the inside so they're hidden and there's not a million ends to weave in when you're done. Here's a photo of the design just before I mailed it to the magazine. It's big and lovely especially in Wooly Worsted merino! For Sizes: 8" x 62"
Welted Hat in Knit Simple Magazine! I am thrilled to show you the Fall issue of Knit Simple magazine because there's a hat using Wooly Worsted yarn! The Welted Hat is knit in Wooly colors Aquamarine and Pistachio and it's so cute! The magazine hits newsstands any day now, be sure to get your copy! Click here to find a Ewe Ewe Retailer near you.